alaTest has collected and analyzed 1485 reviews of Motorola XOOM. The average rating for this product is 4.2/5, compared to an average rating of 4.3/5 for other products in the same category for all reviews. Reviewers really like the battery and price. The screen and performance are also appreciated. The apps and portability get less positive views. We analyzed user and expert ratings, product age and more factors. Compared to other products in the same category the Motorola XOOM is awarded an overall alaScore™ of 90/100 = Excellent quality. 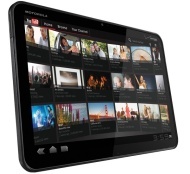 alaTest has collected and analyzed 48 user reviews of Motorola XOOM from Amazon.co.uk. The average user rating for this product is 4.4/5, compared to an average user rating of 4.3/5 for other products in the same category on Amazon.co.uk. People are impressed by the size and reliability. The screen and usability are also mentioned favorably. alaTest has collected and analyzed 93 user reviews of Motorola XOOM from Amazon.com. The average user rating for this product is 4.2/5, compared to an average user rating of 4.1/5 for other products in the same category on Amazon.com. People are impressed by the screen and usability. The performance and price also get good feedback. Opinions are divided on the size. Some have doubts about the battery and portability. 85% of the reviews on Amazon.com give this product a positive rating. Phones far and wide wanted to be the iPhone killer and you know what – tablets are no different. The iPad needs to get used to living with a bounty on its head. And always be ready for the likes of the Motorola XOOM. With Google's next generation of Android, Motorola's knack for great hardware, and Verizon's promise of 4G network compatibility, the Xoom tablet technically offers a more powerful, more capable alternative to Apple's iPad. It's expensive, slightly heftier than the iPad, and novice users may balk at Android 3.0's read-the-manual attitude. Adobe Flash not yet supported. The Xoom's spec sheet is enough to make any tablet tremble, but the price is high and Google still has some work to do before its tablet software experience is as fleshed out and intuitive as Apple's. The Wi-Fi Motorola Xoom is a solid Android tablet with Flash support, but it doesn't measure up to the Apple iPad 2 in terms of app selection. The first Android tablet with Google's tablet-specific Honeycomb OS. Fast. Beautiful, highly responsive touch screen. Flash support. HDMI output for television/computer monitor viewing. User interface seems overcomplicated at times. While promised in the future, there's no support for SD cards at launch. Android Market selection is short on tablet-specific apps. The Motorola Xoom for Verizon Wireless is a solid Android tablet with Flash support, but it doesn't measure up to the Apple iPad 2 in terms of app selection. The first Android tablet with Google's tablet-specific Honeycomb OS. Flash support. Fast. Beautiful, highly responsive touch screen. HDMI output for television/computer monitor viewing. User interface seems overcomplicated at times. While promised in the future, there's no support for SD cards at launch. Android Market selection is weak for Honeycomb. Motorola gives us the Xoom, the first of the Honeycomb-powered Android tablets. It's expensive, heftier than the iPad 2, and novice users may balk at Android's read-the-manual attitude. Despite some useful features, the Xoom's high price and bulky design make it a less than desirable tablet offering. ZOOM ZOOM.The first 10.1" Motorola tablet goes by the name XOOM. Despite some small drawbacks, the Xoom still manages to fill one of the top sports in our TOP 10 tested tablets (German).